Planning becomes an easy feat with so many parks to turn to in the summer heat! It might be hard to imagine, but summer is already on the horizon in Hinsdale, IL. Song birds are singing, the downtown is beginning to bustle, and summer seasonal events are ready for planning. According to Nancy Miller of Coldwell Banker Residential Brokerage, home buyers and sellers are even feeling the frenzy of a bustling real estate market. Houses that sat all winter are having their doors thrown open as buyers are looking for new places to call home. Visions of barbeque, lazy afternoons, and splashing around the various recreation parks of the Hinsdale Park District will all soon be a reality. Pool Membership (early bird discounts until April 30). Both family and individual rates apply here. Senior discounts begin at age 62. For those of you who might have a little extra help at home, Nanny rates are also available with a family pass. If you live in another town, you might qualify for the “Neighborly Rate”! Although proof of residency is required, if you live in Brookfield, Countryside, La Grange, Golfview Hills, La Grange Park, Western Springs, or Willowbrook, you still have a pool to turn to in the summer heat! Cardboard Boat Regatta Yes, you read that correctly! The Village of Hinsdale joins the tradition of fun of other area towns such as Glen Ellyn, with this team building, laugh-out-loud event. Who will win the Titanic Award for best sinking? Find out July 21st! Young and Little Actors Clubs Build self esteem, spontaneity, and a fun environment through the magic of drama class. Perhaps the best gift of summer might be the joy of discovering a flare for imagination. Creative atmosphere mixed with guided themed performances challenge children to explore the world of theater. 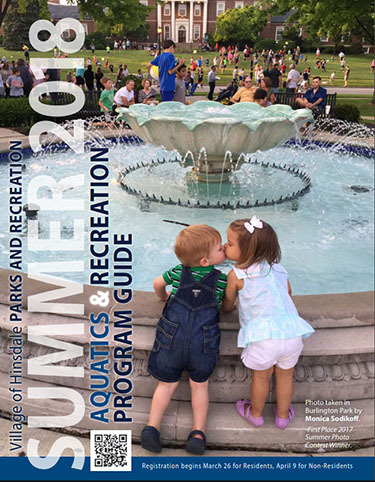 Get Sign Up Details and More Info at the Summer 2018 Village of Hinsdale Aquatics & Recreation Program Guide here­. Recreation may be more of what you have in mind for an adult summer season. For starters, Katherine Legge Memorial Park is home to a collection of recreational activities. The 18 hole Disc Golf Course of obstacles and shaded greenspace promises you’ll enjoy some down time here. 5 Lacrosse Fields and 6 Platform Tennis Courts entertain those looking to pick up the pace. If you’re looking to celebrate a special occasion, and relax instead, the Katherine Legge Memorial Lodge is available in the center of KLM Park, surrounded by over 50 acres of greenery. It’s a beautiful location to visit this summer, no matter what you have in mind. Platform Tennis is a growing sport in the Midwest. If you’ve been bitten by the bug, you may have already been playing indoors all these winter months. Summer brings the promise of outdoor fun from the park district. With 6 courts available at KLM Park, and 2 more available at Burns Field, you know it’s serious. Time to get your game on!